I’ve decided to go right back to the beginnings of Drexciya and work my way up to Neptune’s Lair, everything post this time being now covered. There might well be some detours along the way but this will be my path for the immediate future. There is a great universal theme here to reveal also, as in the Storm series, but I will also be charting the development of Drexciya and their world itself which is certainly worthy of study. 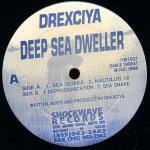 The first release as Drexciya was Deep Sea Dweller which came out in 1992 on Shockwave Records. At the time this now defunct label worked out of the same infamous building as Submerge at 2030 Grand River along with UR and the appointment only Somewhere in Detroit shop. I know that the first Acid Rain release by Underground Resistance is on Shockwave, so I suppose this was a UR sub-label of the time. Drexciya's beginnings are therefore placed right at the epicentre of 90's Detroit techno. Of course they have always disavowed any musical influence from the city but they certainly benefited from its blossoming facilities and growing popularity. Following on from this release would be the 12”’s known as Drexciya 2 - 5. This has to make this number 1, even though it doesn’t state it on the label it wouldn’t strictly be necessary if it was the first. This came out a year after the false start of the L.A.M. 12" Balance of Terror and surprisingly the first two tracks here on side A could easily fit that mould. 'Sea Quake' and 'Nautilus 12' are both extremely fast paced and would suite any dance floor that liked it hard. They are good tracks certainly but not the brave new start you might imagine. However, the two tracks on the other side are the brave new start. The vinyl on this side, perhaps significantly, runs from the inside out and it’s two tracks display the soon to become recognisable Drexciya sound or template. ‘Depressurisation’ and ‘Sea Snake’ are both more medium paced numbers which show off an already mature production technique. Quite why we have such a jarring mix of music on each side of this record might be a sign of wanting to give some variety or possibly an uncertainly over the latter two tracks appeal. The source of this uncertainly might of course lie with the label. It’s no wonder that latterly both of these more recognisably Drexciya sounding tracks were included on The Quest compilation, although to be fair ‘Sea Quake’ is on there too. The fact that the vinyl runs from the inside out on side B might be a neat way to symbolise how different this new sound is to their old, effectively turning it completely on it’s head/backwards. It's strange that the title of the first and last track of the EP are so similar. Again this might be to underline the differing nature(Quake/Snake) of the music while coming from the same source (Sea). National Sound Corporation (NSC) cut the vinyl like they did for UR and a whole host of other Detroit labels. At this early stage the engineers there were a big part of Detroit electronic music, having already turned Jeff Mills on to the possibilities of locked grooves and were working closely with UR on unique vinyl design, check UR’s Rings of Saturn 12”, which also runs from inside out. It might seem surprising that Drexciya seem so happy to label themselves as techno, but this is not so straight forward for this is ‘techno from the deep’. They are here already letting us know they are not going to be a conventional Detroit act, on the surface yes, but look deeper and you will know. It’s always struck me as a nice coincidence that they should work so closely with a company called Submerge too. The image used on the label, shown in negative on the reverse, looks like someone with very long arms outstretched or at a glance the observation deck of a submarine, certainly more down going themed stuff. The credits read simply ‘written, mixed and produced by Drexciya’, which could be read as a clear and proud declaration of independence on their behalf. If we try to date the recordings themselves my best guess would be to put the L.A.M. style tracks around mid 1992 and the other two towards the end of 1992. This in between period might be the real musical breakthrough point for Drexciya, while the whole philosophical side had been gestating since as early as 1989. Following James Stinson’s death Deep Sea Dweller was re-released, along with a number of their 12” from the 90’s, in 2003 by UR. It was great to see Drexciya’s legacy being recognised in this way and the fact that the music could stand up so well ten years later spoke that this was more about the music than someone having died. Drexciya 2 Bubble Metropolis is next. There is a small group of projects with Drexciya involvement which seem to cause a lot of confusion. It's time some order was introduced to them so I've written an outline for each. Is there anymore outstanding projects not covered so far in this blog, as far as I know this last piece on the subject covers it. But any additional information you can furnish me with regarding these specific projects or other ones not covered I would be grateful for and will rework into this article. I've rejigged comment box so that anyone can leave a message or email my main address on banner. This reworking has been something I've been doing all along to make these articles as definite as possible rather than reposting and creating multiple entries as I learn or think of something new to add, so reading some of the previous posts at this stage may a worthwhile exercise. I am only dealing here with the projects I have not already mentioned previously, like L.A.M., Glass Domain, Elektroids etc. FLEXITONE - This project appears to be have been largely overlooked. Production duties were by Gerald Donald and Brendan M Gillen of Ectomorph. Only 2 12"'s came out under this name, 'Rotoreliefs EP' & 'Nausicaa' on Carl Craig's Planet E in 1995 plus 2 other originals on compilations. Deleted by now for sure, I think a compilation of the 7 original tracks and various remixes would be a worthwhile exercise. The title of the latter release is likely inspired by the cult Japanese animation film 'Nausicaa' by Hayao Miyazaki who went on to make the more well known 'Spirited Away'. This may be seems like early signs of Donalds growing interest in Japanese culture which would more fully bloom in the coming years. Donald was reputedly involved with Ectomorph up to this time, which makes sense, but I think we can take it that his involvement was brief, just at their inception. He may or may not be featured on their releases dating up to 1995, but not beyond. Check their Discogs listing for more info and images of artwork, which was high concept. INTELLITRONIC - Credited as a Gerald Donald project, it's single track, 'Pixel', dates from 1993. The track itself reportedly sounds a lot like Drexciya's 'Hydro Theory' which would eventually appear two years later on 'The Journey Home'. Available on the Juan Atkins compiled 'Magic Tracks - Deep Detroit Volume Two' on Tresor which also features Drexciya's 'Positon Island'. Intellitronic, as the name suggests, means intelligent electronics and seems a ripe topic for an offshoot project but I guess this one didn't stick. If it had this would have been the first Gerald Donald project to run in parallel with Drexciya and the argument could be made that this was the first conceptual stirrings of what would become the Elektroids. X-TERNAL PULSE - This dates from way back in 1993 and appears to feature one or both of the Drexciya members input at the very early stages of Ultradyne. The sole track, 'Crossphaze', came out on the 12", 'The Silicon Ghetto EP Vol. 3', on Daniel Bells Accelerate label. Again check their Discogs listing, which has a comment which mentions a marked similarity to Drexciya's 'Wave Jumper', a track which would eventually come out on 'Aquatic Invasion' on UR the following year. I guess that makes it less surprising that this would be one of the rhythms they were playing around with at this time. I’m not sure how long this working relationship existed with Ultradyne members Alex Lugo and Dennis Richardson, it hardly seems likely that they were still involved in the next release, all of 2 years later. This EP, ‘E-Coli’, was part of a 12” series on Warp alongside Drexciya and The Electroids from 1995. The artwork for the three releases was similar and it was marketed very much as a package at the time. This does imply a connection between all the bands but its hard to say for sure if any of the tracks on their EP had any Drexciya production involvement or not. They may have just had the one session together for all we know, which is often the nature of these things, and when Warp came up with the idea for the series and needed a third related act they simply nominated their friends project. Previously I did an interview with Ultradyne in which they gave the impression of being very much a self contained group and makes me doubt that any material released under the name Ultradyne featured any outside input, although that question was not asked specifically. CLARENCE G - James Stinson solo project with one now very sought after 12" to its name which came out on Detroits Fluorescent Forest Records in 1991. The four tracker features more of an electro/ hip hop sound but it does have one track, 'Turbine', that is a dead ringer for 'The Countdown Has Begun' which would turn up on 1994's 'Aquatic Invasion'. The title of the EP is ‘Hyperspace Sound Lab’ which is wording that wouldn’t seem out of place in the future. The only aquatic aspect of the release is the black and white picture of Stinson reclining on a rock beside a lake or ocean on the label. Another false start or just another project before he settled on something more definite? I would say the latter. DIGITAL APHRODISIAC - This pseudonym was only ever mentioned on the Dimensional Waves website, built and written by James Stinson. No releases seem to have emerged under this name. It appears at the end of a list entitled ‘Production Company Fuelled by High Powered Groups’ which included mostly Storm aliases. Sounds like another project which was planned or never finished, certainly unreleased. DR. FINN & DR. OTTO HENKE - Gerald Donald alias used only once for remixes of 'Wasteland' by Scan X. Released in 1996 on Laurent Garnier's F Communications label. Here Donald gets his own side of a the 12" for his two mixes of the title track, which he subtitled as Prototype 1 and 2. The name continues his flirtation with German imagery, just more ambiguously than usual. DREXCIYAN DJ STINGRAY - The first appearance of this guy to my knowledge was on the Warp Magic Bus Tour in 2002 and he continues to do shows to this day. All that Stinson said on this subject was, “We are going to send out a Drexciyan DJ first to secure the land,” in relation to following it up with live shows. I remember him playing a pretty pitched up electro set of fairly contemporary tracks. He played masked to further hide his identity. Not to be confused with another US DJ working under the name DJ Stingray. His name is actually Sherard Ingram and he produces under the name Mystic Tribe and Urban Tribe. He has a large discography which includes an album on Mo Wax with input from Carl Craig and Moodyman. There is also of course a Mystic Tribe track on the flip of The Other People Place 12" on Clone.